There are a multitude of job fairs targeting vets across America. A site called Jobfairing, a job board directory has a huge list of events happening across the country. 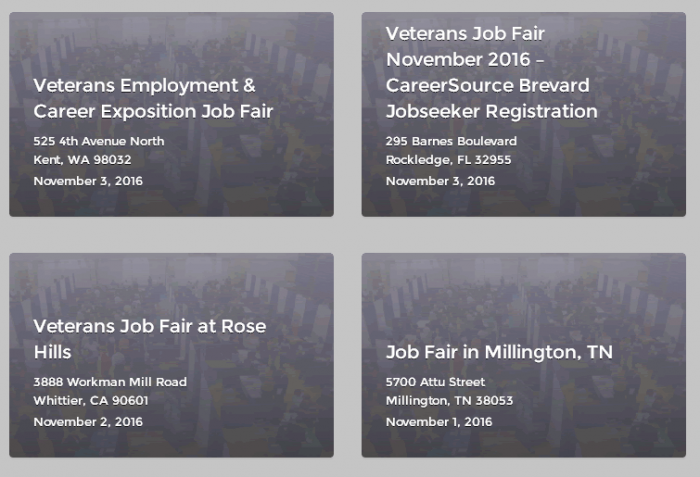 Click here for list of veteran job fairs. 1. Do Your Homework – Research the companies that are going to be at the job fair before you go. Understand what each company does so that you don’t waste time asking the company but instead are talking about how you might be able to solve a problem for them. 2. Dress For Success – A good rule of thumb is to dress as though you are going to an interview, because, in essence you are. This means no jeans, flip flops, t-shirts, or any other attire that may be considered unprofessional. You could have anywhere from 3-5 minutes to talk directly with someone from human resources and some employers take you aside and do short interviews on the spot. 3. Update Your Resume – If you haven’t touched your resume in the past 60 days, review it. Make sure all your contact information is up to date, as well as, bring plenty of copies. 4. Practice Introducing Yourself – You can do this with friends and family or even in the mirror. Be ready for questions about your skills and experience. 5. Project Positivity and Enthusiasm – Express your interest in speaking with the recruiter by shaking hands, smiling, and have good eye contact. This is not the time to talk negatively about your past job – focus on the opportunity in front of you. 6. Follow up – When talking to the employers, ask for a business card and follow up with a thank you email.